The following excerpt is from a WebMD video titled "Personal Story: Sleep Apnea." Michael Breus, PhD, DABSM: What we’re seeing today is an epidemic of sleep deprivation. Roughly 10% of the population at any given time can have sleep apnea. That's more people that have diabetes and asthma combined. Adam (patient): When I don't sleep well, I mean, you're constantly exhausted and constantly having a feeling of being lethargic. Laura (Adam's wife): He can tend to move the bed if he's really snoring. Adam: I think it did have an impact on my relationship with my wife. When, you know, the next day, you're both so tired because of this miserable night that you just had. Dr. Breus: Adam came to see me for a consult and we discussed what was going on with his sleep at night. And what we decided was to have a formal sleep study. Nurse: So, do you have any questions before I start putting all the wires on and give you an explanation [of the sleep study]? Adam: And then she walked me through the whole process of what she's going to do. I mean, from start to finish. They do put the electrodes on your head. It's very painless. There are bands that go around your chest that monitor your breathing. Dr. Breus : We reviewed the data and we discovered that Adam was stopping breathing in his sleep and snoring literally hundreds of times an hour. We decided that CPAP was the most appropriate form of treatment. Dr. Breus: CPAP is a small mask attached to an air compressor which pushes air down his (Adam's) throat allowing him to breathe all evening long. Nurse (conducting study in sleep lab having placed the CPAP on Adam): Awesome. Ok. That's it. You can get some sleep, ok? Adam (after the sleep study with the CPAP): I felt an impact immediately. Laura: I sort of joked that he looked like Hannibal Lector but it's changed our lives for the better. 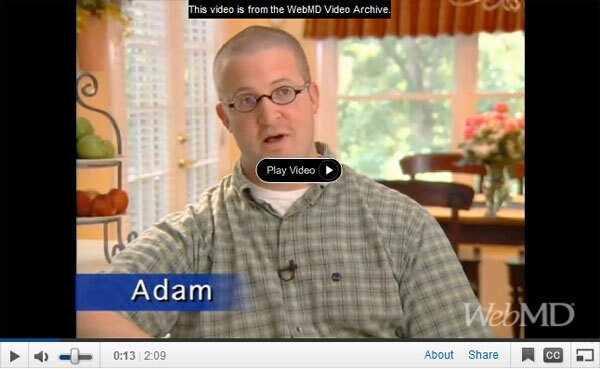 Dr. Breus: Adam has lost weight. He feels better during the day. His concentration is better. And he's less sleepy. Adam: And I actually dropped 45 pounds in a matter of 6 months. Laura: His metabolism has completely gotten into check and he looks amazing. Adam: My sleep now is incredible. Laura: There's not that disgruntled married conflict going on when you're going to sleep. Adam: I think it's an easier fix than people realize.